Last Saturday night was another bad one for LSU when it comes to Alabama. For the eighth consecutive time, the Tigers were beaten by the Crimson Tide. There was one difference this time as coach Nick Saban’s Alabama team thoroughly dominated LSU in Tiger Stadium 29-0. Saban’s four previous victories in Baton Rouge were all very close games. 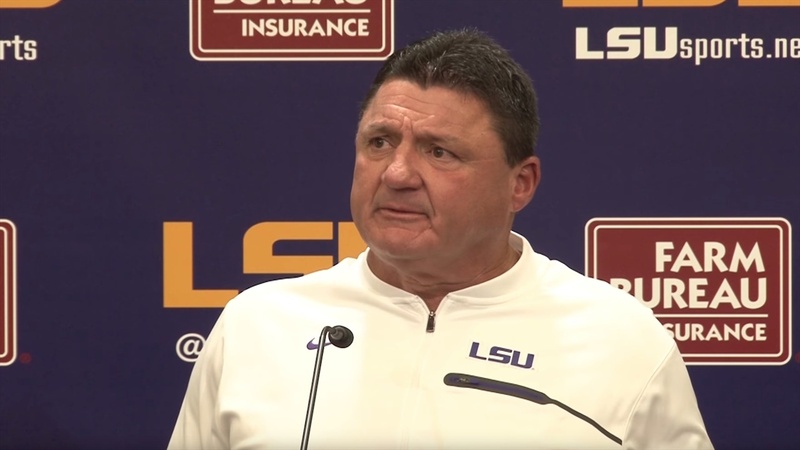 Following the game, Tigers coach Ed Orgeron was very critical of the team’s offensive and defensive linemen. Orgeron flatly said that LSU must recruit better players on the offensive and defensive lines. There is no doubt that the Tigers were whipped on both lines of scrimmage. But, calling out the players publicly could certainly lead to problems in the locker room. Orgeron definitely realized that he could lose this season’s team. “(Monday) is the biggest day of my coaching career since I’ve been at LSU,” said Orgeron at his weekly media luncheon Monday. “I have to be at my best today. There are a lot of hurt people in the (football) building. There are a lot of hurt people on our football team. Orgeron knows that there has been much conversation about his remarks following Saturday’s game. He has a plan for how he will speak with the players. Orgeron certainly had a different viewpoint of what occurred against Alabama on Saturday. He pointed the finger at himself for the 29-point defeat. Orgeron has a 0-3 record against Alabama. The Tigers have been outscored 63-10. LSU has been shut out twice at home by the Crimson Tide. It had been more than 60 years since a team recorded back-to-back shutouts against LSU in Tiger Stadium. Georgia Tech beat the Tigers 13-0 in 1950 and 7-0 in 1955. LSU gained less than 200 yards against Alabama. Running backs Nick Brossette and Clyde Edwards-Helaire combined for 19 yards on 13 carries. Joe Burrow was sacked five times. Orgeron used Austin Deculus and Adrian Magee at right tackle. For the second straight game, Deculus was replaced by Magee. Orgeron is not sure which player will start against Arkansas on Saturday. Orgeron gave safety John Battle, who hurt his ankle, a 50/50 chance of playing against the Hogs. Although there will be no appearance in the Southeastern Conference championship game for LSU for a seventh straight season, it still controls its own destiny as regards appearing in a New Year’s Six Bowl game. The Tigers should be among the top ten Power 5 Conference teams when the next College Football Playoff Standings are announced Tuesday. Victories against Arkansas, Rice and Texas A&M would get LSU a spot in either the Sugar, Fiesta or Peach Bowl. None of Orgeron’s teams at LSU has dropped back-to-back games. Following defeats against the Crimson Tide the past two years, the Tigers have responded with convincing 38-10 and 33-10 victories against Arkansas.